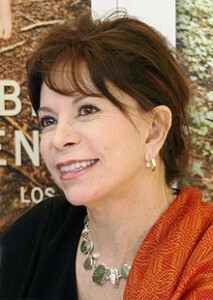 Isabel Allende is one of Latin America’s foremost female writers. Through translation, her work has received acclaim in the United States as well. Allende was born in Lima, Peru in 1942, but returned to Chile with her mother at the age of three when her father, a diplomat, disappeared. Two years after her father’s cousin, Chilean President Salvador Allende, was assassinated in 1973, she fled with her husband and children to Venezuela. She published her first novel, La Casa de los Espiritus (The House of the Spirits) in 1982. Other works include De Amor y de Sombra (Of Love and Shadows) in 1984, Eva Luna in 1989, El Plan Infinitivo (The Infinite Plan) in 1991, and El Ciudad de la Bestias (City of Beasts) in 2002, as well as a collection of short stories, Cuentos de Eva Luna (The Stories of Eva Luna) in 1990. Allende writes in Spanish, combining sometimes harsh, realistic, and political fiction with the surreal in the tradition of magical realism. Her first novel, La Casa de los Espiritus, is a history of Chile through the female lineage. Here, as well as in her other books, she contrasts strong female characters against the traditional Latin American patriarchy. The women are the active, perceiving characters who confront traditional authoritarian power with their own marginalized power. The women in Allende’s novel achieve power through intellect, relationships, magic, and morality. The immorality of traditional authoritarian power is demonstrated through the men of the novel. Estaban Trueba, the patrón of Tres Marias, forces his will on his workers and keeps them economically subordinate. Esteban Garcia, Trueba’s illegitimate grandson, represents the brutal, right-wing military that overthrew Salvador Allende in the 1970s. Garcia derives power through cruelty, violence, fear, and intimidation. Miguel, a left-wing extremist, uses the violence of revolution to overcome the violent new right-wing regime. However, it is the female characters who are empowered and triumph over abusive power. Esteban Trueba’s clairvoyant wife, Clara, will never be dominated by her husband. Blanca, their daughter, refuses to give up her lower-class lover or remain in an arranged marriage. Alba Trueba, the protagonist and narrator, is involved in the recording of history like her grandmother, Clara, who kept dozens of notebooks throughout her life. Alba shows great moral character and strength of spirit when she is tortured by Esteban Garcia in the right-wing regime. The female characters in Isabel Allende’s La Casa de los Espiritus overcome vengeance and cruelty. They refuse to remain victims. They are powerful as a part of the cycle of history. Allende, like her characters, is empowered through the writing and recording of her own history, and the history of Chile. “Isabel Allende.” Encyclopædia Britannica. Encyclopædia Britannica Online Academic Edition. Encyclopædia Britannica Inc., 1997. Web. 24 October 1997. <http://www.britannica.com/EBchecked/topic/16232/Isabel-Allende>. “Book of the Year (1996): Biography: Allende, Isabel.” Encyclopædia Britannica. Encyclopædia Britannica Online Academic Edition. Encyclopædia Britannica Inc., 1997. Web. 24 October 1997. Loach, Barbara. Power and Women’s Writing in Chile. Madrid: Editorial Pliegos. 1994.